Condominium living in a SECLUDED PARK LIKE SETTING CLOSE to RESTAURANTS and SHOPPING along Frankfort Avenue. 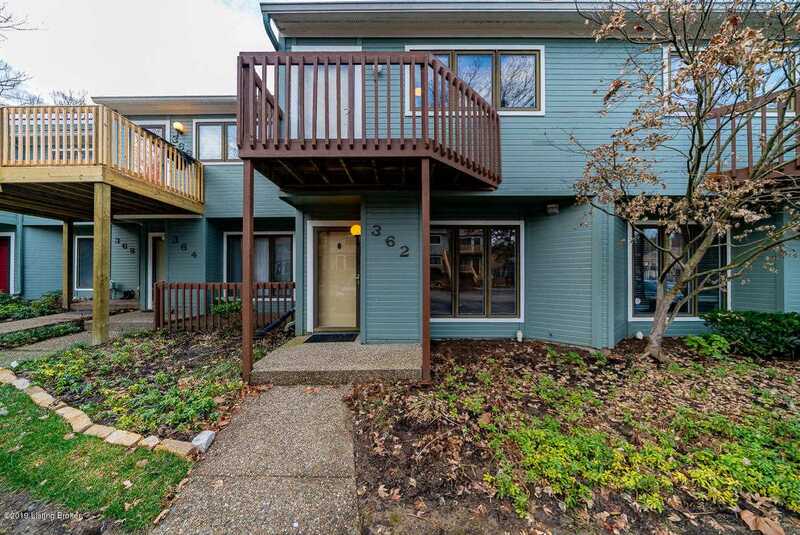 This desirable Crescent Spring Condo is MOVE-IN READY and offers 2 bedrooms, 1.5 baths, vaulted ceilings, skylights, deck and plenty of storage. Updates include new carpet on the first floor, fresh paint and two Anderson storm doors. All appliances remain, including the washer and dryer and the 1 year old refrigerator. You will find 3 dog walk areas located on the complex. Maintenance fee includes trash, water, sewer, snow removal and lawn care, in addition to the amenities. Enjoy Condo living of a LOW MAINTENANCE LIFESTYLE with affordable amenities! Directions:Frankfort Avenue to South on Ewing, turn West on Bicknell, then right on Crescent Spring to condos. SchoolsClick map icons below to view information for schools near 362 Crescent Spring Dr Louisville, KY 40206.